Here at ResultsMail, we know you need better business tools to help you achieve better success, better sales, and better prestige. Your budget is always tight. There’s never enough hours in the day to finish your to-do list. And the competition for your target audience’s attention grows more intense every year. So we’re always challenging ourselves to make your life easier by simplifying and automating our email marketing service wherever possible. We know that nobody likes to (or has the time to) work harder than necessary, especially when it comes to using email marketing software. Even better…this feature is FREE for ResultsMail users, and you can use it to automate and simplify all of your upcoming email blasts. 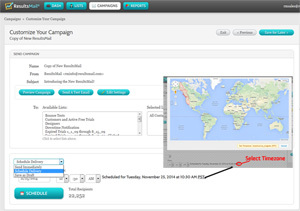 You already use ResultsMail to send emails all around the globe. Now, you can schedule an email blast for sending to your audience’s inboxes while you’re fast asleep! 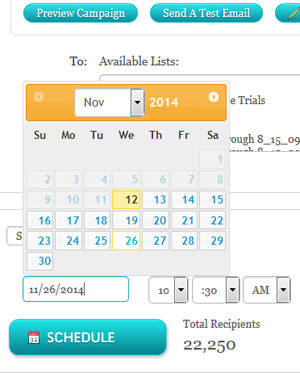 ResultsMail will now schedule your campaign to be sent according to these custom parameters. You no longer have to log in and manually send your campaigns. Schedule the sending and leave the rest to us. (And no, we aren’t relying on a team of trained chimpanzees to push buttons at the right time…This powerful feature relies on ultra-powerful and reliable digital technology that will knock your socks off…Plus, we had a dream in which Charlton Heston told us – in no uncertain terms – not to use chimpanzees). As always, thank you for choosing ResultsMail for your email marketing services. We hope you enjoy using this FREE new feature! Send a Message of Gratitude with Our New Veterans Day Email Templates • It’s Holiday Email Marketing Time!